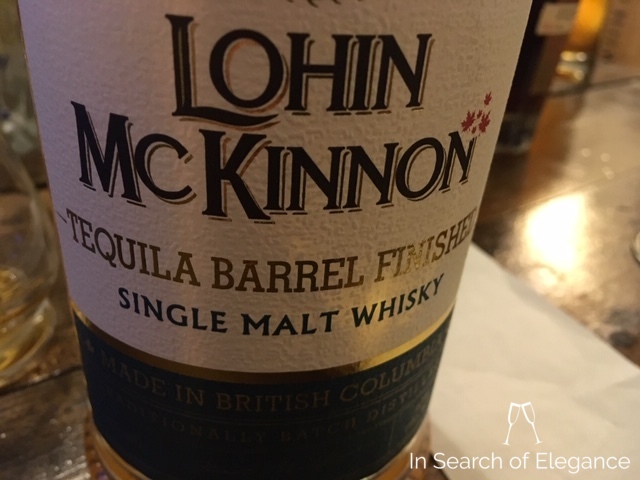 This is a Lohin McKinnon which has been finished in Tequila casks which were described by the barrel broker as “Mexican Heaven” barrels. This is the only Tequila finished whisky that I know of, certainly the only one in Canada. I know Wiser’s has experimented with Tequila finished whisky but they haven’t bottled any. This is one of the annual special releases from Lohin McKinnon (last year we saw the excellent chocolate malt). The nose is spicy, intensely grainy, and full of rich earthy notes: roasted root vegetables, orange, cacao, toasted coconut, and pear. There are some nice floral notes, too – which sit on top. This would be an example of a nose that I would call “layered” – the floral notes sit on top, with citrus and plum beneath, then some sweet spice and a touch of tequila, and then earthy notes at the bottom. Quite a nice, rich maltiness with this one. The palate has dark brown sugar, a mild oakiness, vanilla, a touch of jalapeno, oat cakes, rich honey, and a bit of sour agave just towards the end. The middle of this whisky is so rich – it’s quite fascinating. It still sits a bit “heavy” as if from youth, or maybe that comes in from the barrels. I like how the whisky has a tequila characteristic, but it isn’t dominated by it. I’ve found that I’ve liked Lohin McKinnon more and more as I’ve tried more of it. Recommended (81% of whiskies I’ve reviewed to date get this recommendation or higher). It’s very rare to find Tequila finished whiskies – in fact this is the only one I know of which has been bottled (I’ve tasted some which weren’t bottled), so on a uniqueness scale, it’s up there. It’s a fun one for blind tastings. Value: Average. It’s pretty unique, and is on the cheaper side of micro-distilled single malts in Canada (70$).